Bristle Magic is a cleaner and reconditioner that uses recycled ingredients to remove oil and acrylic paints from paintbrushes. Even dried-on paints can be removed with Bristle Magic. 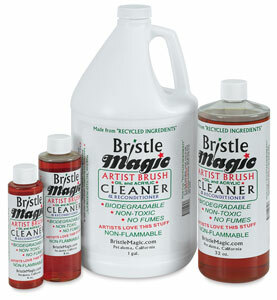 An environmentally friendly product, Bristle Magic is non-toxic, non-flammable, biodegradable, and reusable. What's more, it produces no fumes or hazardous vapors!